The Marcels are as advertised, the guys who put the "Bomp" in the "Bomp-A-Bomp" back in 1961 when their first recording, "Blue Moon" sold over two and a half million copies. The Marcels can boast of three record albums, numerous hit singles, with sales in the millions. 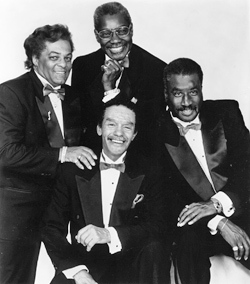 They also recorded the theme song, "The Greatest Love" for the motion picture, "The Interns" and appeared with Chubby Checker in the film "Twist Around The Clock." Their signature song, "Blue Moon" has been used in at least four major motion pictures and various TV shows, such as Sha Na Na, Cheers, Moonlighting, Laverne & Shirley, Happy Days, etc..